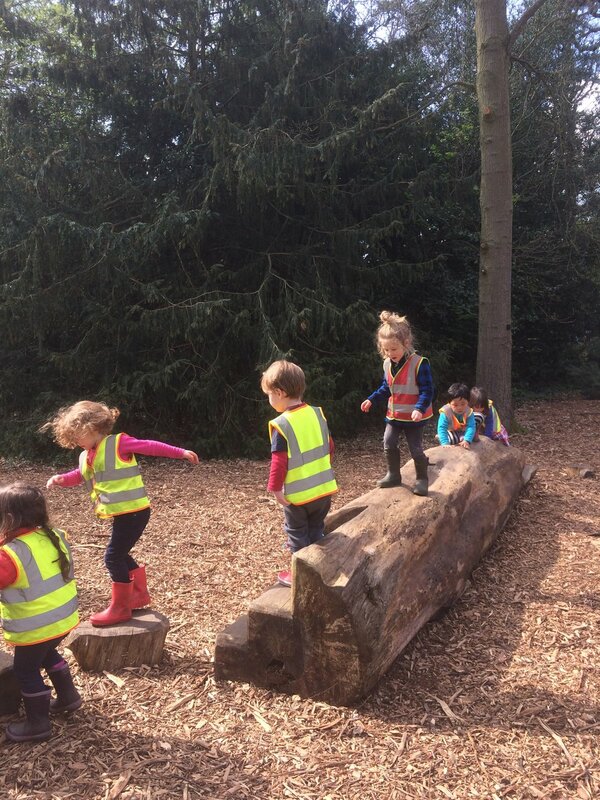 Little Forest Folk holiday camps run at each of our nurseries during school holidays. Our holiday camps are an opportunity for children aged three to seven to be immersed in nature in our forest settings. Our forest adventurers spend their days exploring, building dens, using tools, hunting for mini-beasts and creating works of forest art. We run, we climb, we balance and we laugh, thriving in spending time outdoors. Little Forest Folk's approach is child-led and play-based, the children's imaginations can run wild. Holiday camp days run from 9.30am to 3.30pm with drop off and pick up at our forest setting. Nutritious and homemade lunch and snacks are included. We can take children not enrolled at our nurseries aged three to seven and we usually recommend a minimum booking of two days per week. We give priority booking to any children who attend our nurseries. Due to high demand for holiday camps, booking for external families is now via a lottery based system. To find out about upcoming booking lotteries, please sign up to our holiday camp mailing list below. We will email families five weeks prior to any holiday camp with instructions on how to take part in the booking lottery. Families will then be selected at random and we will be in touch via email if you have been successful to give you the opportunity to book a place. We hope your little ones can join us for forest adventures! Sign up with your email address to be notified about our holiday camps, which includes instructions on how to take part in the lottery system and how to book. All camp bookings made will be non-refundable and non-transferable. Medication must be handed over to staff and will be kept in a locked box onsite (where possible, please administer all medication prior to drop off). For thorough details on what to wear for camp see our recommended kit list here. We aim to bring you home happy, tired children at the end of each day who have had a blast in the forest. In order to ensure we keep your children happy I am afraid that we will not be able to take into the forest any children not dressed appropriately or with waterproof clothing during rainy days - the last thing we want is soggy, cold children! There's no such thing as bad weather, only bad clothing... so dress them well and they will have a blast. A homemade lunch will be served each day taking into account any allergies present in the camp. Campers will also be provided with homemade snacks in the morning and afternoon. See our current menus. Please ensure your child does not have any food in their bags. We have children enrolled at Little Forest Folk who have allergies to a range of foods, so to prevent the risk of allergic reactions and illness, we ask families leave any food items at home. In addition we have cheeky squirrels in the forest who have been known to eat through backpacks to get to food inside! If you would like your child to bring their own lunch due to allergies, please put this in a clearly labelled tupperware box in your child's rucksack and advise a staff member so they can remove it once we arrive on site and lock it into our animal proof storage box! Thank you. We understand that this is a camp for young children and leaving Mummy and Daddy can be a traumatic experience (sometimes more so for Mums and Dads, then the little ones!). Due to the nature of the camp, we can’t allow parents to accompany their children as we find it affects the dynamic of the camp and it can make it harder for those children whose parents are unable to stay. In the event that your child become upset in the car park at the thought of separation, we can allow parents to walk the 300m walk to our forest site and hopefully the walk through the woods is enough to spark their curiosity! In the event of high winds or lightning; we will contact parents to collect their children or in the event that children cannot be collected, we will evacuate the site and will transport children back to our permanent site.